Water Resistant Dragonfly Pattern Large Weekend Bag (Size 47x33x32x14.5 Cm). At TJC we have handbag styles for any and every occasion. Discover our beautiful and truly versatile range of ladies handbags alongside a few stylish treats for the men. From structured statement tote handbags, slouchy shoulder bags, classy clutches, cool satchels and everything in between, we’ve got something special to suit every style throughout the seasons. With TJC combine fashion and function and indulge in specially crafted collections, fine materials and fashionable yet timeless designs. At TJC we always have the ladies in mind, our fashion buyers scope the hottest runway shows and seasonal key pieces ensuring your wardrobe is updated with runway styles you love, into real life with affordable pieces. 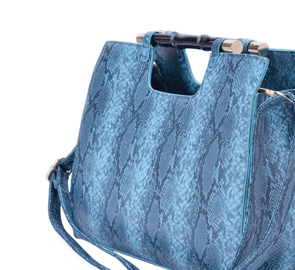 We’ve matched fashion and function together with our collection of women's day bags. Discover smart work bags, stylish weekend totes and shoppers, cool satchels and backpacks, all spacious enough to fit your daily essentials. Be tote-ally happy with our tote bags! A tote bag never goes out of style. From oversized bags in stylish colours, plush leathers and stylish pattern and prints to daytime shoppers with serious style points, at TJC you’re spoilt for choice. Complete your glamorous look with our luxurious collection of clutch bags ideal for any occasion penned in your calendar! From hard case clutches and sequined box designs for evenings, to envelope clutches for everyday wear, these fashionable pieces will have even the stylish and savvy happy. We know you love fashionable styles that have been all over the latest season’s catwalks, which is why our buying team scour the hottest fashion shows, and put together a trendy handbag collections inspired by your favourite designers. Road trip? Weekend break? Discover stylish, sturdy holdalls and spacious carry-alls in our collection of weekend bags ensuring you hit the road in style.